Tokyo Otaku Mode Joins Japan Tourism Agency’s Visit Japan Campaign! TOKYO - Tokyo Otaku Mode Inc. (incorporated in Delaware, U.S. by President and CEO Tomo Kamei), the managing body of Tokyo Otaku Mode (TOM), a worldwide distributor of otaku content including anime, manga, and cosplay, announces its participation in the Visit Japan Campaign, the Japan Tourism Agency’s project to promote travel to Japan, as well as the implementation of promotions for overseas Japanese pop/subculture fans through a partnership with Expedia (Washington, U.S. / CEO Dara Khosrowshahi), the world’s largest online travel site. This is the second year in a row that TOM will be participating in Visit Japan Campaign. The special website (http://otakumode.com/sp/visit_japan) launched last year by TOM during its participation in the Japan Tourism Agency’s Visit Japan Campaign, held with the cooperation of Japanese-managed companies using Japanese pop culture in overseas marketing, is getting a massive renewal for this promotion. The site will reopen on Aug. 1, 2014 and will include a survey campaign in which Expedia travel discount coupons will be given out, as well as videos of influential overseas figures introducing Japan, and other content to promote travel to Japan. Last year, foreign travel to Japan broke through 10 million people for the first time, and the Japan Tourism Agency aims to increase this number to 20 million by the year 2020. The recent increase in foreign travel to Japan is due to considerable travel from East and Southeast Asia, which will be a huge contributing factor in achieving the goal of 20 million foreign visitors. The main target of the Visit Japan Campaign is to increase travel to Japan from countries in these regions, including Taiwan, Thailand, Hong Kong, the Philippines, Malaysia, Singapore, and Indonesia, with a sub-target being increasing travel from all English-speaking regions, beginning with North America. Of the over 15 million fans of TOM’s Facebook page, 99% are from outside Japan, with a large percentage being English speakers from Asia (45%). The results of last year’s Visit Japan Campaign, which TOM also participated in, made it clear that the majority of social media users who would potentially travel to Japan came from Southeast Asia and the Americas. Meanwhile, Expedia has a great number of users with a high interest in traveling overseas, with nearly 90 million unique users every month, mainly from the U.S., and over 10 million subscribers to their email newsletters. As an enterprise undergoing global expansion, Expedia is currently putting great effort into projects to promote travel to Japan and is developing both online and offline campaigns and promotions. TOM and Expedia are now teaming up for the “Japan 5-Day Sale,” which begins on Aug. 5, 2014, in hopes that this will increase interest in traveling to Japan among potential travelers and will have a direct effect on increasing actual travel to Japan as well. The “Japan 5-Day Sale” campaign is scheduled to be held once a month until December 2014. A survey about traveling to Japan will be held on TOM’s “Visit Japan with Tokyo Otaku Mode” website. Respondents will be issued a coupon for use on Expedia. The survey will target users with an interest in traveling to Japan, while the provided coupon will be promoted to increase travel to Japan. During the campaign period (Aug. 1, 2014 to Jan. 15, 2015), TOM will award $5 coupons useable on the TOM Premium Shop to 50 users, chosen by lottery, who post a commemorative photo they took while in Japan to Facebook or Twitter with the hashtag #visitjapan2014. Through such photo posts, which show travelers enjoying Japan, TOM will increase interest in traveling to Japan among its overseas users. The first 100 people to make a purchase at Kotobukiya Akihabara-Kan (Tachikawa, Tokyo / CEO Ikko Shimizu), the flagship store of a figure and plastic model manufacturer famous worldwide, will receive TOM original goods as a gift if they show staff the campaign page or otherwise say that they saw the Tokyo Otaku Mode campaign. 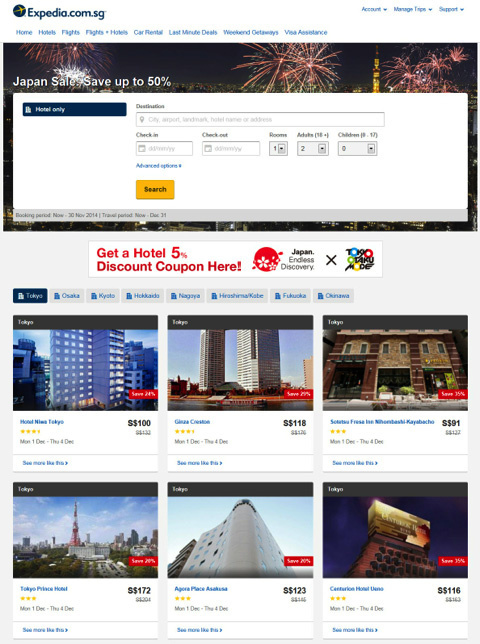 The “Japan 5 Day Sale” will take place on the Expedia website. Those who subscribe to email newsletters will be sent a special email regarding the “Japan 5 Day Sale.” Interest in traveling to Japan will heighten when information about the sale and Japanese pop culture appears on Facebook, as well as when Expedia users with a high interest in overseas travel are directed to a special website. Videos will be provided of influential overseas figures introducing Japan while sightseeing, including Japan culture researcher and university professor Matthew Chozick and world-renowned cosplayer Alodia Gosiengfiao, who has 4 million Facebook likes,. nformation will be provided about Japanese pop culture-related events to be held in Japan, including Comic Market 86 and the Tokyo Game Show. Expedia is the global leading online travel agency. It operates over 30 local websites, employs over 10,000 staff worldwide and has a turnover of close to US$34 billion in gross booking. It prides itself in helping travelers plan and book their travel by providing a personalized service, the latest technology, as well as a wide selection of over 290,000 hotels and 400 airlines. Every local website offers holiday packages, cheap flights, hotel bookings, car hire and in-destination attractions to suit all travelling needs. In Asia, Expedia operates 11 sites including Hong Kong, India, Indonesia, Japan, Korea, Malaysia, Philippines, Singapore, Taiwan, Thailand and Vietnam. Expedia has been awarded the ‘Best Online Travel Agent’ in 2010, 2011 and 2012 by TTG Asia, Asia-Pacific’s leading travel trade publication. In 2013, Expedia was named the “World’s Leading Online Travel Agency Website” by the 20th annual World Travel Awards (WTA), the ultimate travel accolade from the travel industry. Tokyo Otaku Mode (TOM) is a worldwide distributor of otaku content––including, anime, manga, cosplay, and otaku entertainment news. TOM is owned and managed by Tokyo Otaku Mode Inc., which was incorporated in Delaware, U.S. in April, 2012 by President and CEO Tomo Kamei. TOM began on Facebook on March 24, 2011 as a page for introducing to the world Japan’s otaku content––including anime, manga, games, and goods, as well as the latest news and event reports (http://www.facebook.com/tokyootakumode). A mere 22 months after its Facebook page was established, TOM surpassed 13 million likes to become the first Facebook page managed by a Japanese company to clear this milestone*. 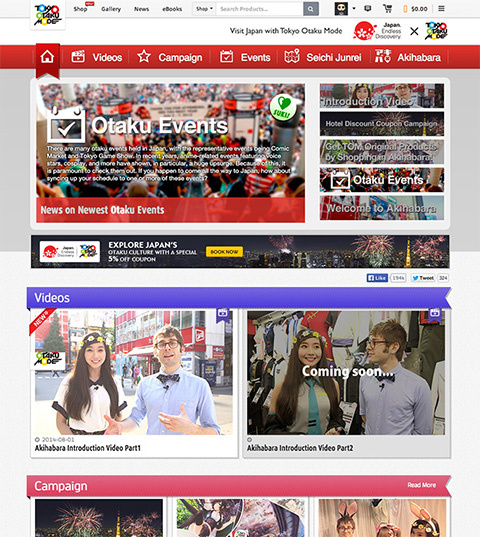 In the fall of 2012, TOM launched its web service Tokyo Otaku Mode (http://otakumode.com), which includes a user-generated content (UGC) platform on which Special Creators can upload their own otaku creations––such as cosplay, illustrations, figure photos, and latte art––as well as a news page for delivering to the world the latest news on otaku culture straight from Japan. In the summer of 2013, TOM launched its worldwide e-commerce site Tokyo Otaku Mode Premium Shop (http://otakumode.com/shop), which sells anime-related goods as well as original goods developed through collaborations with its Special Creators.